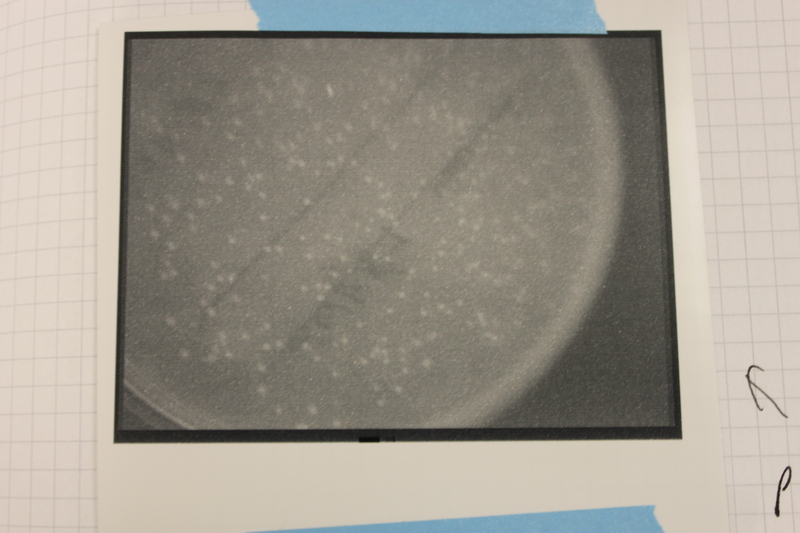 The latest plasmid I tried out for bacterial transformation works well and has a cool end result. The plasmid, pVIB, was constructed with genes from a marine bacteria Aliivibrio fischeri by Engebrecht et al. 1983. This bacteria is bioluminescent and lives in symbiosis with some fish and squid species allowing them to glow in the dark. The enzyme that produces the light is called a luciferase. The plasmid also contains a gene for ampicillin resistance to allow transformed E. coli cells to be selected. So I did a heat shock transformation with pVIB and competent cells, like I blogged about earlier (here and here). 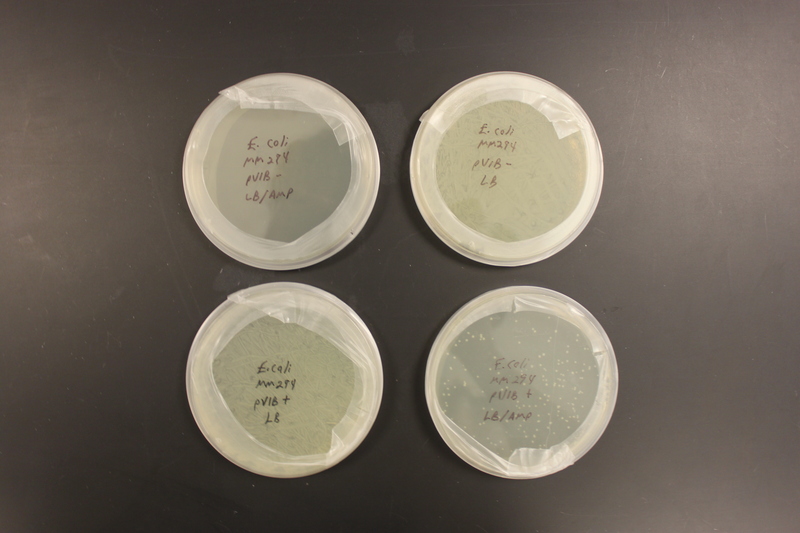 In the image above the upper right and lower left diagonal plates are E. coli spread on luria broth (LB) plates without any selective agent. This is both with (lower left) and without (upper right) a plasmid added to the mix. It might be hard to see but it is just bacteria growth all over, coating the surface. This is referred to as a "lawn" of bacteria. 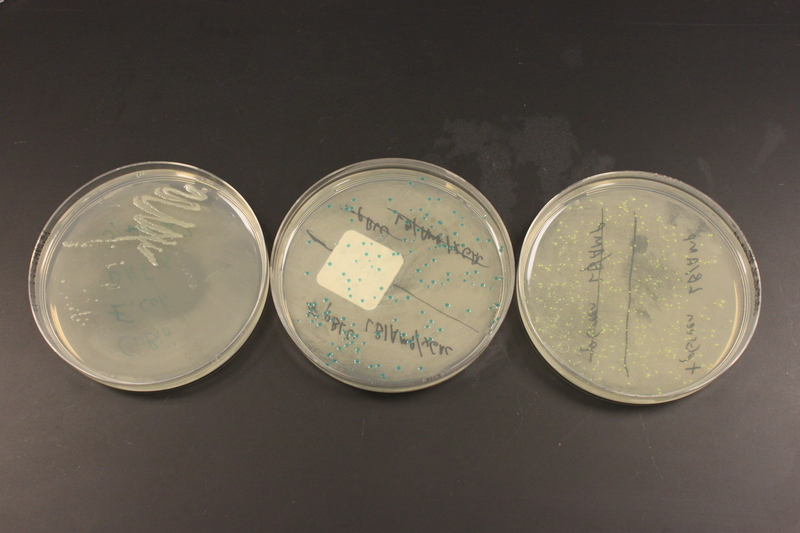 In the upper left an antibiotic (AMP, ampicillin) has been added to the media and there is no growth. The cells have been completely killed. In the lower left the plasmid (pVIB, containing a gene for AMP resistance) has been added and only cells that have taken up the plasmid can grow on the AMP plates. This plasmid contains the genes to produce bacterial luciferase (a dimer (two proteins bind together) with α-luciferase and β-luciferase subunits. 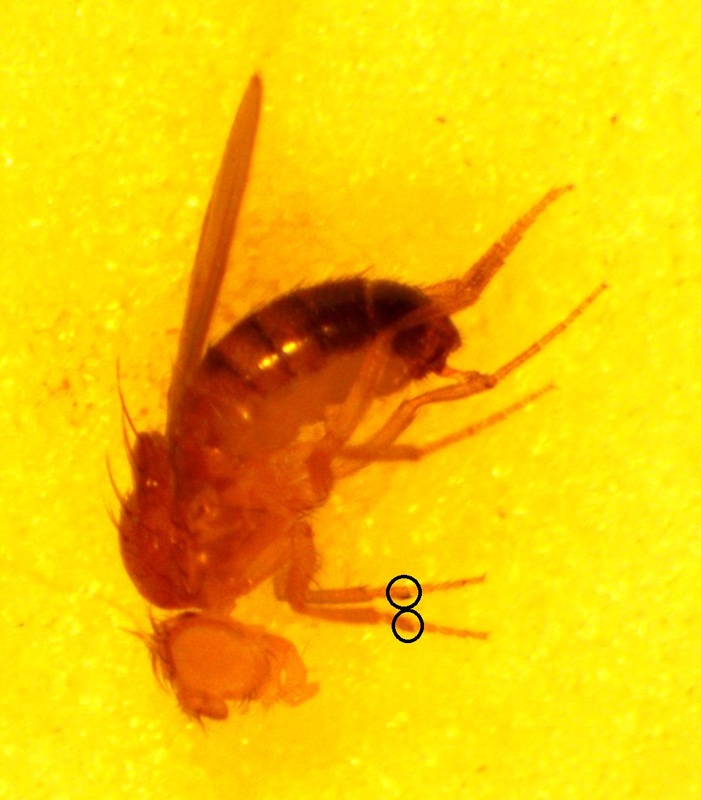 The structure was determined by Fisher et al. 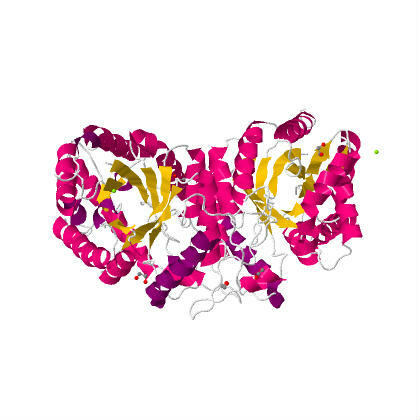 1996 (link to structure at protein data bank (PDB) and the PDB molecule of the month). 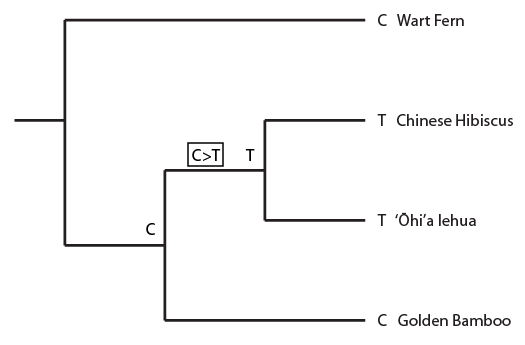 Actually there is a operon (expressed together) of five genes including the two luciferase units. The operon is symbolized by luxCDABE, which gives the order of the genes. luxA and luxB are the alpha and beta subunits. The other genes convert long chain fatty acids into aldehydes with ATP. From the PDB site you can visualize and rotate the 3D structure of the enzyme. The image above shows the alpha subunit on the left (which contains the active catalytic site) and the beta subunit on the right. These two proteins bind together and create the enzymes quaternary structure. 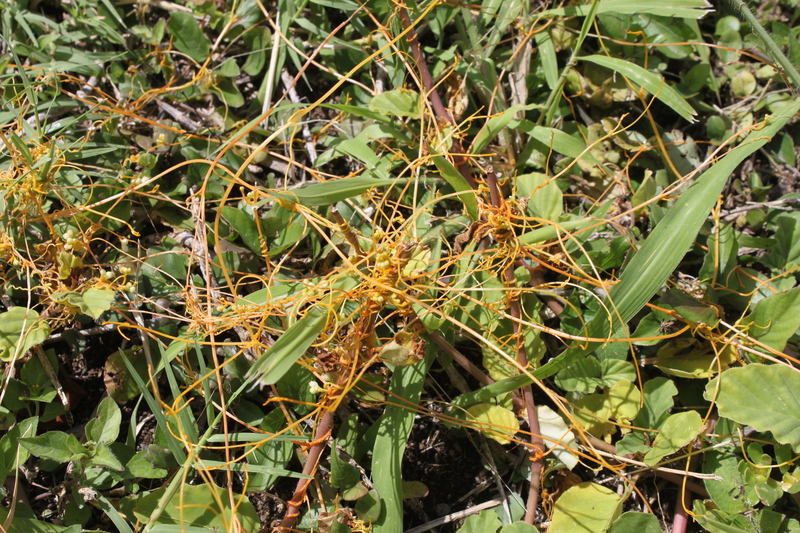 Below is the same view but the components are color coded by secondary structure (alpha helices in red and beta sheets in yellow). You can see that there is a similarity between the alpha and beta units. 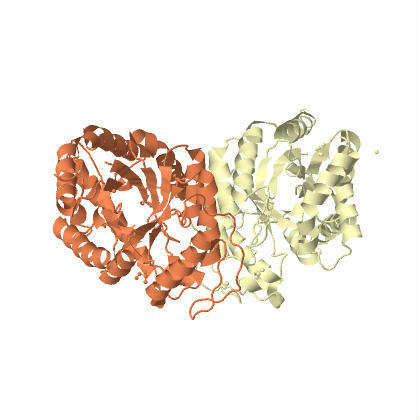 It is hypothesized that the beta unit originated as a duplication of the alpha unit and it enhances thermal stability of the enzyme (a fusion protein of the alpha and beta units is sensitive to high temperatures, Escher et al. 1989). 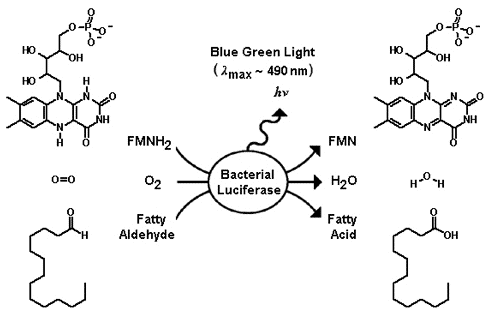 Also, here is a webpage (and here) that contains a great deal of information about bacterial luciferase (there are lots of types of luciferse, like the one in the firefly, but they have different structures, etc.). 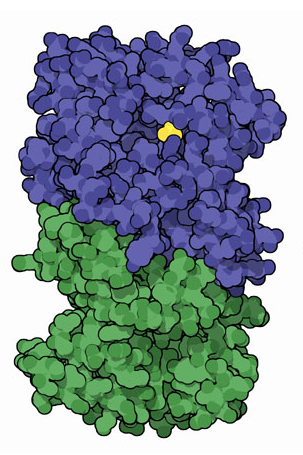 In this image above the active site that catalyzes the reaction is indicated in yellow, within the alpha-subunit (blue). The enzyme takes luciferins, in this case a reduced flavin mononucleotide, and a long chain aldehyde, and oxidizes them with molecular oxygen to produce flavin mononucleotide, water and a fatty acid. There is an excess of energy in the reaction that is released as light with a peak wavelength at around 490 nm (nano-meters) which is a blue-green color. The additional genes in the operon convert the fatty acid back into an adlehyde. luxC is a reductase, luxD a synthetase, and luxE a transferase; and these assemble together into a fatty acid reductase enzyme complex. Below is the larger reaction showing the fatty acid being converted back into the aldehyde for the luciferase reaction (and the flavin mononucleotide being reduced to recycle back in). Below are a series of pictures showing the transformed cell clones in progressively lower light levels. They look like normal E. coli cells in bright light. The last picture is an exposure of several seconds. The glow is visible by eye, but you need to be in a dark room and let your eyes adjust for a minute. The glow doesn't last forever. It was strong 24-48 hours after the transformation. Producing the luciferins requires a lot of the cells energy in the form of ATP for the reductase and the effect is temperature sensitive. I put the plates at 4°C for 24 hours to preserve the bacteria then took them out and the glow was gone. However, I warmed them up to 30°C for an hour and it was back almost as strong as before. I stored them at 4°C again for over a week, then warmed them up again and the glow was completely gone. This entry was posted in Uncategorized on April 30, 2013 by Floyd A. Reed. I found a nice blog post (link) discussing the falling rates of successful funding from the National Science Foundation (specifically DEB). I've copied a graph from the post below. The number of proposals is growing each year, which is good. However, the funding is not growing. So the success rate is dropping and is now in the single digit (currently ~7% level) and falling. People with new positions, like myself, are getting hit especially hard. 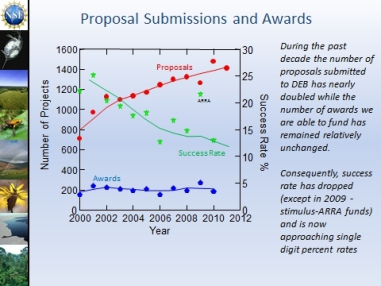 I have submitted an NSF preproposal each year and have not been successful yet in getting funding from them. (I have however obtained funding from the Hawai'i Community Foundation, which I am very grateful for.) Because getting grants (and publishing) early in your career is necessary for getting tenure this is pushing many new faculty to explore alternative ways to get funding, as I did with the HCF. Follow the link at the beginning to see the original article. As you can see, the National Science Foundation is not even on the radar and falls below the lowest listing of $9 billion for the EPA. When people see "NSF" what do we want to come to mind? "National Science Foundation" or "Non-Sufficient Funds"
This entry was posted in Uncategorized on April 29, 2013 by Floyd A. Reed. In the previous post about mutation predictions I only considered mutations in one direction (for example, from functional to non-functional gene sequences (while non-functional to non-functional mutations were ignored because the outcome is the same).) 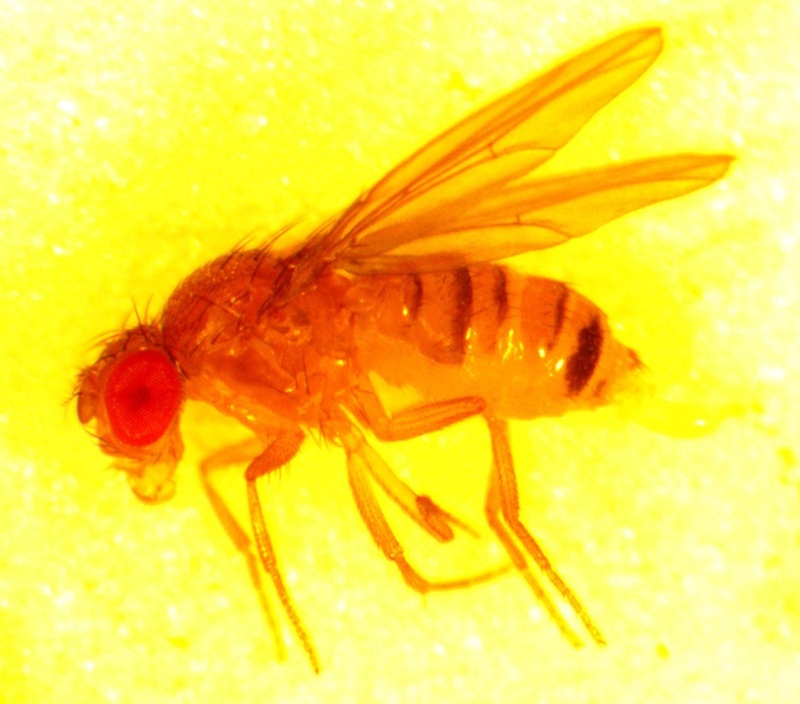 However, some mutations can be thought of as reversible. We could think of a nucleotide position mutating from an "A" to any other base-pair state ("C," "G," or "T") and then back again to an "A." Or, we could think about changes in a codon that alternate between two different amino acids. For example "CAT" and "CAC" both code for histidine while "CAA" and "CAG" both code for glutamine in the corresponding polypeptide (protein). The only change is at the third position so a "T" or "C" is one amino acid and an "A" or "G" is the other. As the sequence mutates and evolves between these four bases at this position we could think about this as reversible between two amino acid states. 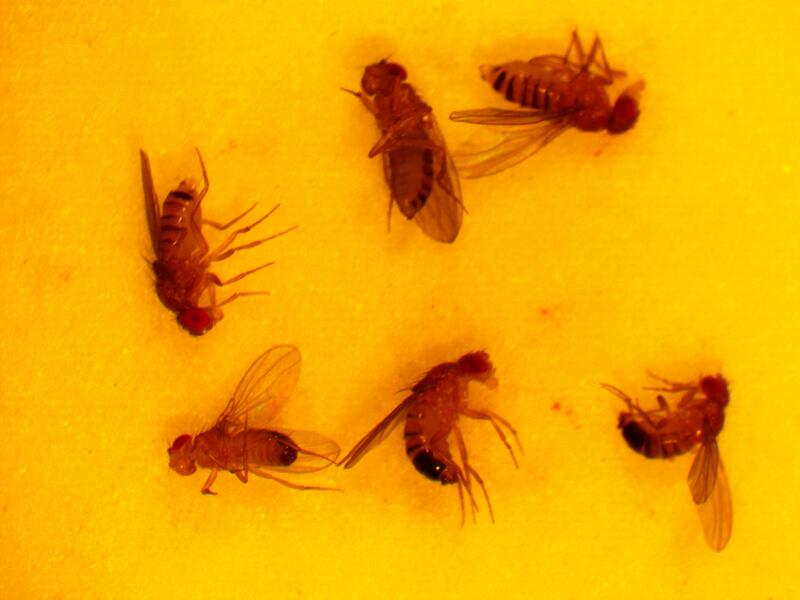 Another type of mutation is even closer to the sense of reversible. Transposable elements are small stretches of DNA that can insert into a gene sequence, sometimes inactivating the gene, and then later excise out of the sequence, which might restore the original function. 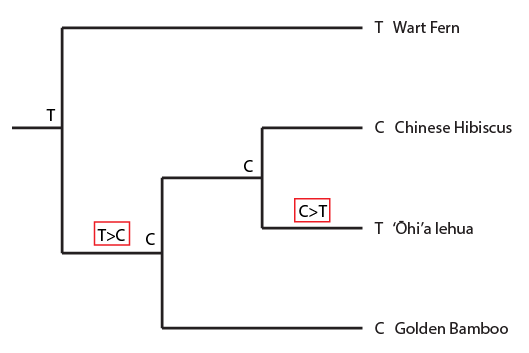 In fact, transposable elements (or "TE's") are quite common in the genome of many organisms. 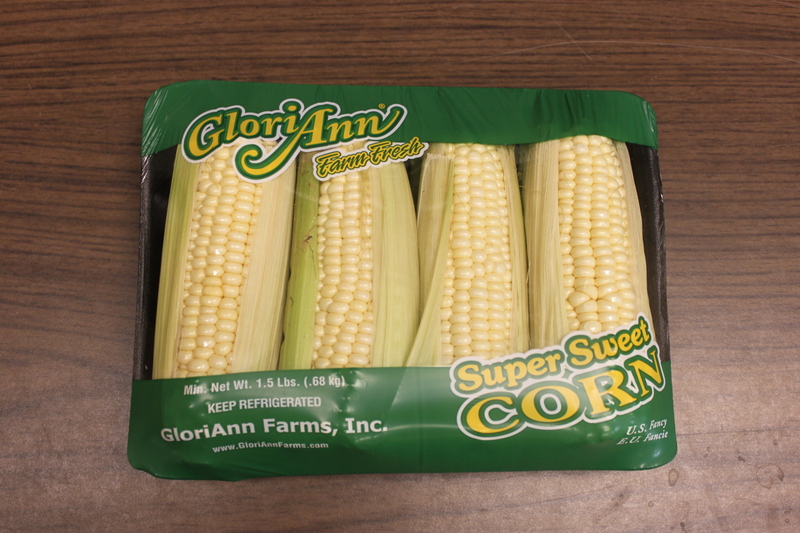 In the image below is an example from corn (in which TE's were first discovered). 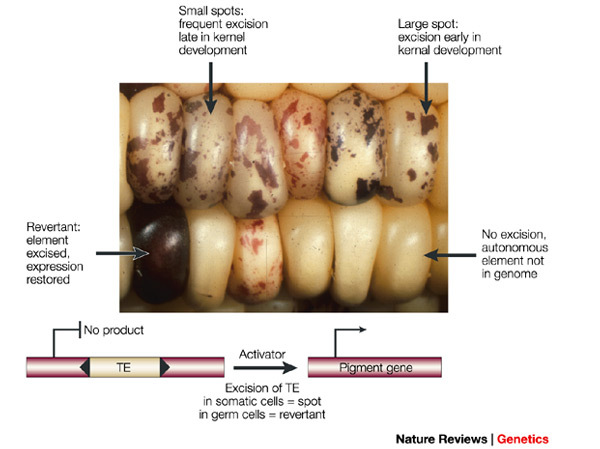 Starting with an individual that has a TE inserted into a gene that produces the purple pigment (so no pigment is produced and the kernels are white) the TE can excise in certain cells (giving purple spots) and may even excise in the germ-line cells so that the next generation has completely restored pigment production. We could also write this from the alternative alleles point of view . Either way works the same in the end, but for the rest of this we are using the version. Subtract from both sides to get the terms together. From looking at this equation you can see the the equilibrium frequency of an allele is given by the mutation rate to the allele state as a fraction out of the total of the mutation rates, . So for example, if is one half of the total rate of mutations (in other words if ) then . This seems to make intuitive sense, if different alleles are mutating into each other at the same rate, then over enough time the population will be made up of a 50/50 ratio of the alleles. which makes sense in the sense that the equilibrium allele frequency is only a function of the mutation rates (again the starting point should disappear because after an infinite number of steps toward a single equilibrium the result will be the same no matter where you started). Also, looking at again. If we have a total mutation rate then the first part of the equation, , is basically the same as the simpler model of irreversible mutation, . So we can interpret the first part of this equation, , as the fraction of alleles that have not mutated yet. Of course this will disappear as the equilibrium is approached. and looking at the part on the right. Now that we realize this is a geometric series we might be able to reduce the finite series. Again, as goes to infinity goes to zero and becomes . which makes a lot of sense. We realized above that this was the fraction that had not yet mutated, which is the reason the curve deviates from equilibrium (i.e. starting points are different). Plugging in the mutation rates from the example above we find that the difference in highest and lowest trajectories drops to less than 1% after 38,375 generations. The probability that a transposable element inserts into a specific gene sequence is very small. Once it is inserted (and sticking with simplistic assumptions here) the probability it will excise is likely much higher than the insertion in the first place. Say we had data from huge fields of purple kernel color corn that had been maintained for many generations. In, let's say, 3% of these we find a mutation due to a transposable element that prevents the pigment from being produced. Assuming the population is at or very near to equilibrium what can we say about the insertion versus excision relative mutation rates? Backing up to a more basic level, why is there an equilibrium at all? We might also intuitively think that if one mutation rate is higher than the other that we would eventually end up with all of one type (allele) in the population. (Actually this can happen when we start talking about drift in finite population but we are still ignoring that at the moment and pretending populations are so large that they are essentially infinite and even tiny fractions will be present.) The trick to thinking about this is that as one allele becomes rarer it is a smaller target for mutations in the population. As it becomes more common and in more copies there are more opportunities for mutations to occur to change the allele into a different form. This frequency effect "buffers" the alleles towards intermediate frequencies, so an allele is never quite lost or fixed and we end up with an equilibrium. 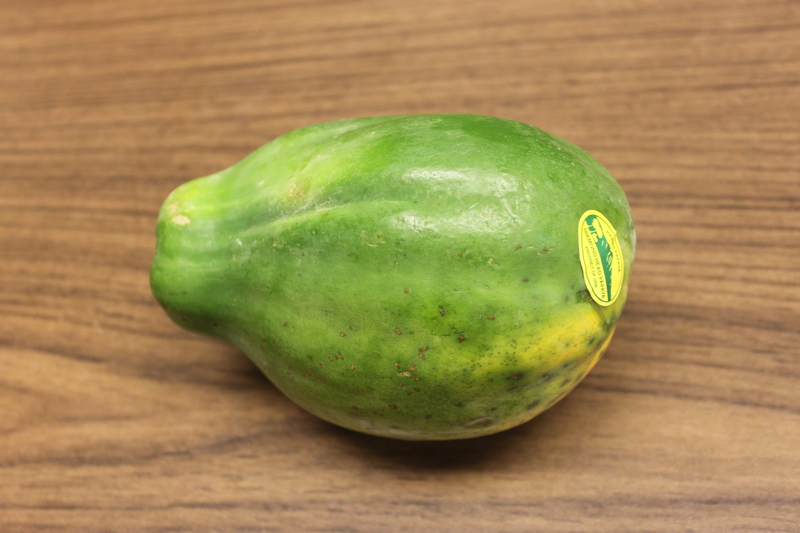 This entry was posted in mutation, population genetics on April 28, 2013 by Floyd A. Reed. 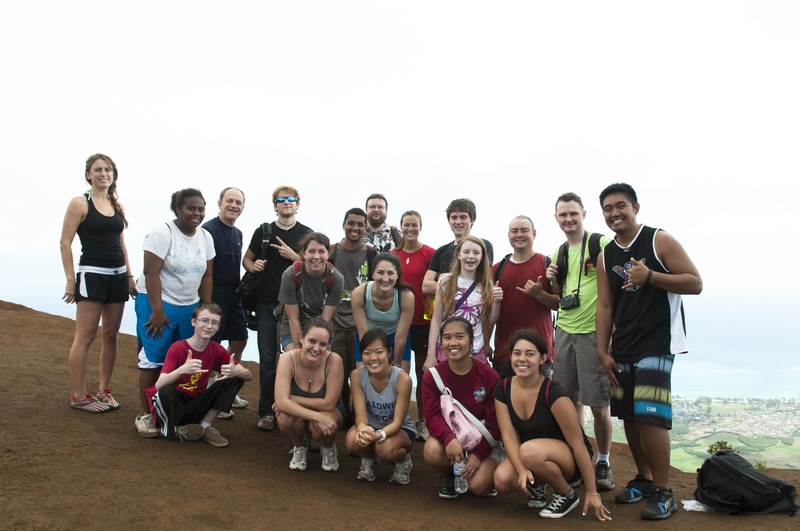 Last Saturday our department organized a hike up Kuliouou Ridge Trail (link and link). It was aimed to bring faculty, staff, grad students and undergrads together in a social activity. Some family members also showed up. It is a very scenic hike but also very steep toward the end. (There were also a couple scary drop offs right next to the trail.) At the top we could look over to Kailua on the other side of the ridge. Afterward we had lunch under tents at Kuliouou Beach Park. This entry was posted in Uncategorized on April 25, 2013 by Floyd A. Reed. I am still working out what to use this blog for. In the most important sense I want to provide a way for the general public to see some of what goes on in the daily work of scientists and university professors. Also, as a way for people to see a little of what I am up to. This may also function as a log of activities; however, I do not intend for it to be a full and complete record in any way. Rather this is an informal and possibly eclectic compilation of topics. This week our department is having the 38th Annual Albert L. Tester Memorial Symposium in the Keoni Auditorium of the East-West Center, and I volunteered to chair the first session yesterday morning. The symposium is a series of presentations of student research from any department. First however, Dr. Tim Tricas gave a short introduction of who Albert L. Tester was, what topics he worked on (Fisheries Biologist) and some memories people shared with him of people who knew Dr. Tester. Then Jaclyn Mueller from Oceanography gave a talk about "Efficient extraction of nucleic acids from microbial plankton (viruses, bacteria, and protists) collected on aluminum oxide filters." I talked with her briefly before the session and she is working on marine RNA viruses. The concentration of viruses in ocean water is amazing. This was followed by Carolyn Parcheta from Geology and Geophysics on "Volcanic fissure conduits: the first quantification of shallow subsurface geometry." She made maps on the centimeter scale of fissures to better understand outgassing dynamics. One detail from this talk was the use of lydar to 3D map deep into volcanic vents beyond what is visible on the surface. I wonder if rovers could be used to crawl deeper into the fissures to map them some more? Then Tyler Hee Wai from Mechanical Engineering talked on "Investigating Dusk and Dawn Shifts in Snapping Shrimp Sounds." There is an applied angle to this work. The baseline of snapping shrimp sounds can be used to remotely detect boat motors. It is completely passive and undetectable so activities like fishing in marine refuges could be detected. Finally, the final talk of the first morning session was by Chelsea Marvos from Nursing on "Emotional Intelligence and Clinical Performance/ Retention of Nursing Students." I also talked to her before the session; nursing programs have a problem with retention and she is investigating how predictive the performance on an emotional intelligence test is for student retention rates. Afterward there were questions from the audience about what the test is like. She said parts of it can be strange like asking to interpret the feeling of a picture of a pile of rocks, etc. However, during her talk she said emotional intelligence is something that can be trained and brought up the possible value of incorporating this into nursing training programs. This entry was posted in Uncategorized on April 20, 2013 by Floyd A. Reed. 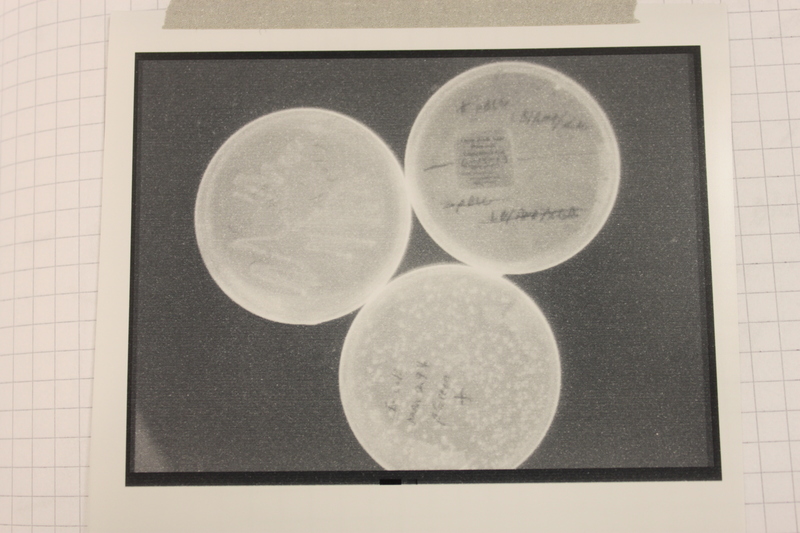 Above are three plates of media with E. coli bacteria growing on them at 37 C overnight. This is a different strain of E. coli called DH5alpha (I used MM294 earlier) but neither one has antibiotic resistance. In the left plate, without antibiotic, I "streaked" out cells by running a sterile wire loop back and fourth through the cells repeatedly, making a dilution until I could pick a single clone colony of rapidly growing cells. I then transformed the cells using heat shock. The plate on the right is expressing GFP (as part of a fusion protein with lacZ) that gives them a green color that I mentioned in an earlier post. 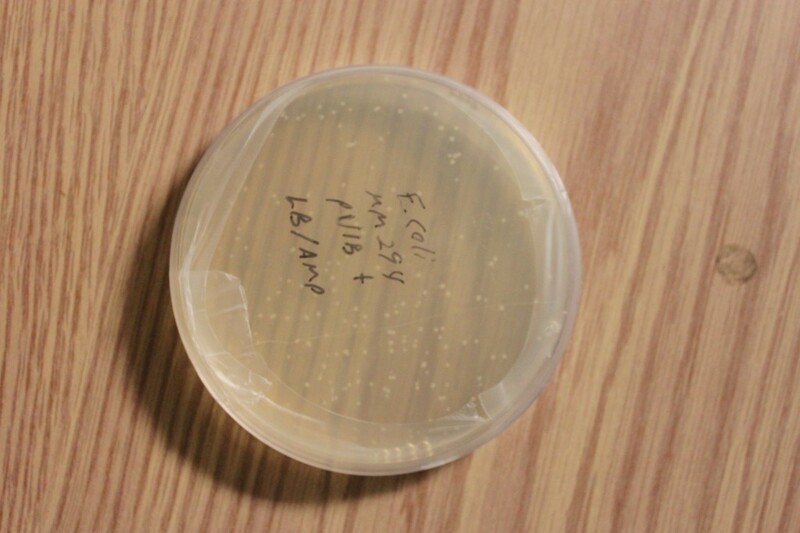 The plate in the middle shows colonies that are dark blue, they are expressing a fully functional lacZ gene and have X-gal added to their media. Chemically X-gal "looks" like a disaccharide (a "double" sugar molecule made of two simple sugars). lacZ normally cuts disaccharides to make monosaccharides for the cell to use, however when X-gal is cut a molecule containing bromine is formed that spontaneously forms a new molecule with itself and gives the cells the dark blue color. 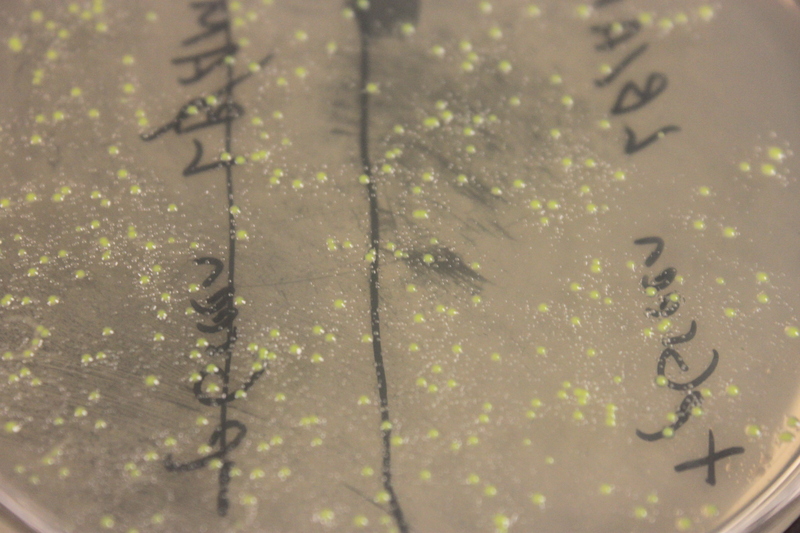 In the close up image above you can see smaller "satellite" colonies around the GFP transformed cells. In these plates ampicillin is used to select for only the cells that have taken up the plasmid, which contains an amp-resistance gene. However, the enzyme produced destroys ampicillin in the media around the cells, which allows cells that were not transformed to start growing. You have to be careful not to pick the nearby untransformed colonies when attempting to clone a DNA sequence in a plasmid. I tried looking at the GFP expressing cells under UV light in a dark room and I could not see them glowing. So I put the plates in a transilluminator we use to take pictures of gels. It uses UV light and the camera can be set for a long exposure. Above is the image from the UV transilluminator. 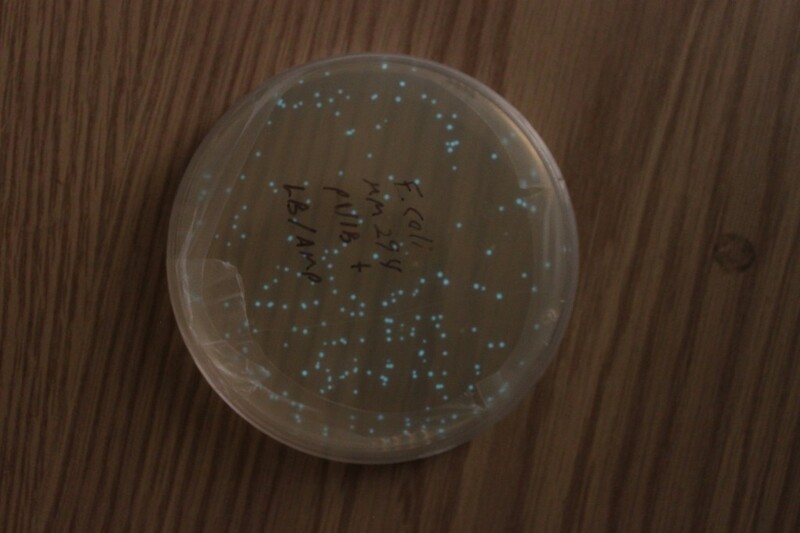 You can see bright spots where the colonies are growing, but is this GFP? I put some other plates in for comparison. 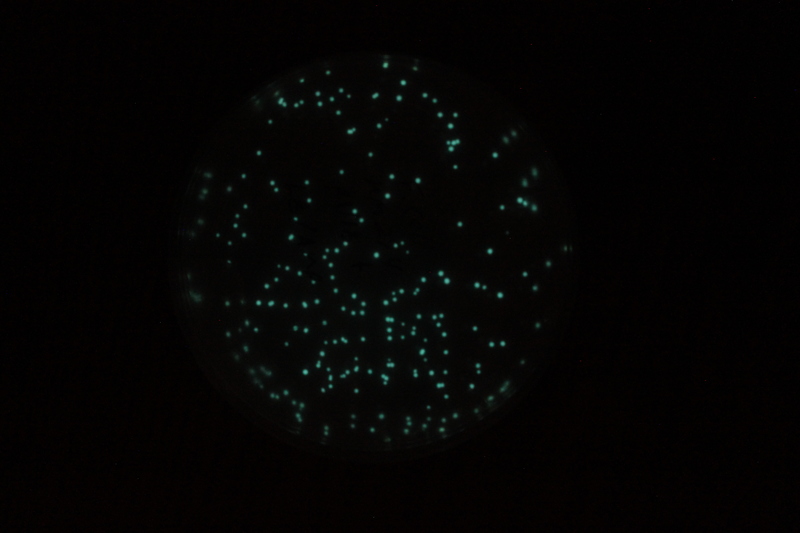 On the bottom is the GFP expressing plate, on the upper right are the lacZ colonies, and one the upper left are untransformed colonies I streaked out. The lacZ expressing cells are darker, but this could be because of the blue dye from Xgal. The regular cells seem bright, perhaps from auto-fluorescence, which does not make the GFP cells very convincing in terms of fluorescence. I am going to try some more variations. Part of the reason I am doing this is to get a bacterial transfromation/cloning system up and running in the lab, another part is to find a nice system, or set of systems, for teaching a genetics lab in the fall. This entry was posted in Uncategorized on April 15, 2013 by Floyd A. Reed. This semester I have been working through some basic population genetics background to prepare for a class I plan to teach next spring. One place to start is on the predicted effects of mutations. The simplest model to begin with is one of irreversible, one-way, mutations. Imagine a functional gene sequence and that mutations can occur to disrupt the gene function, effectively turning it "off." I like to mention working on cars for analogy. If you made small random changes to car parts, the most likely outcome, if anything happens at all, is that you break the function of the part and render it useless (rather than gaining a new and different function or, even-rarer, improve its function). 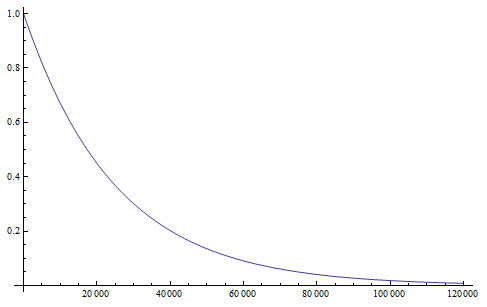 This curve follows a (discrete) geometric distribution and over long periods of time can be closely approximated by a (continuous) exponential distribution. This is an example of exponential decay like the classic curve of radioactive decay and the idea of radioisotope half-lives. The same type of curve and equation applies even if we do not start off at a 100% frequency of one allele. Say the functional allele is at 50% frequency, , then one generation later 10% of the 50% mutate leaving 90% of the 50% unmutated, . Generally, if the starting frequency at time zero is then the frequency after generations, , can be calculated as . Another way to look at this is (the frequency at time g is equal to the frequency in the generation before, g-1, multiplied by the fraction that did not mutate, . However, and , etc. Substituting in the reverse order, and , etc. Quickly we see that from a beginning point the equation becomes because we are multiplying g-times. One reader did not like the previous paragraph and found it hard to understand; I'll try to present it again here in just equation form. , if is defined as the number of generations after exists. 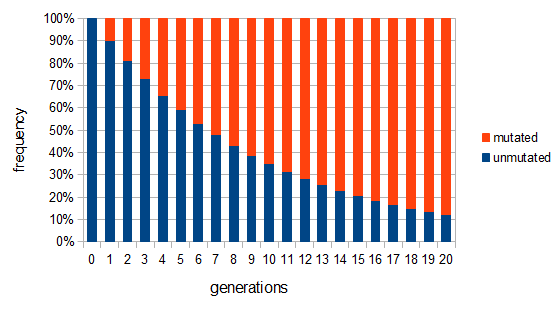 Actual mutation rates vary widely over several orders of magnitude but in general are much lower than the example of 10% per generation I used above. Often, the mutation rate affecting the function of a gene is on the order of to per generation. The mutation rate at a single nucleotide site in a DNA sequence is on the order of . It can be tricky to measure mutation rates directly. Often mutations are recessive or are not completely visible as a phenotype. However, in humans there have been several studies focusing on achondroplasia (a form of dwarfism) to measure mutation rates. The mutant allele is dominant, so a single copy results in the dwarf phenotype. The phenotype is fully penetrant (if you have the allele you have the phenotype, in contrast many human traits are incompletely penetrant). Finally, the phenotype is unambiguous. These factors make measuring the rate of appearance of achondroplasic individuals from birth records ideal for directly measuring mutation rates. Results from different studies vary but rates on the order of 1 in 25,000 or have been found. Obviously, selection and genetic drift are important factors affecting allele frequencies in real populations. Mutations in the FGFR3 gene that result in achondroplasia are removed from a population by selection and never attain high frequencies. 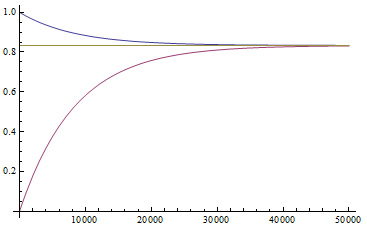 However, for the moment I am keeping things simple by only looking at the predicted effects of mutation rates. Imagine a species that moves into a cave system and then the population is cut off from the outside world (so called troglofauna, or cave animals). If genes are no longer needed in the cave environment, like ones involved in eye development or pigmentation patterns, how long would we expect functional alleles (different forms of a gene) to remain in the population? In other words, mutant non-functional alleles are no longer removed by selection. Using from above and setting (so that the frequency at time is the starting frequency at time zero, we get a half life of the functional allele of 17,328 generations. showing the initial steep drop and then leveling off of the change in frequency due to mutations. If we consider a generation to be about a year long for many species than after about 120,000 years (which is not really that long) any genes that do not have functions that are selected for are expected to be inactivated and functionally lost from the genome. This can easily explain the pigment-less, eyeless cave fish found in the southeastern US. Turning this around, if a gene is found to be functional and preserved in the genome and at a high frequency (>90%) in the population, it follows that it is being maintained by selection in the recent past. Humans along with many other primates (and independently guinea pigs) have lost the ability to synthesize vitamin C because of mutations in the GULO gene (the remnants of which still remain on our 8th chromosome). 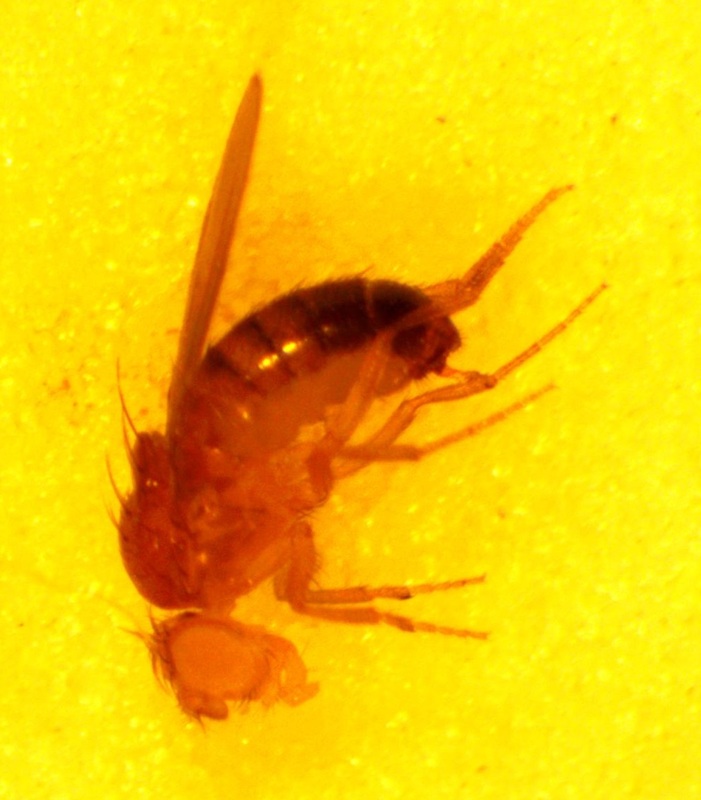 This suggests our distant ancestor had plenty of vitamin C in their diet for thousands of generations and that mutations in GULO were not removed by selection. This also suggests a way to measure mutation rates by changes in allele frequency in the absence of selection, if we know when the selection pressure was removed. Imagine bacteria that carry a plasmid with resistance to two different types of antibiotics. Initially they are kept on media containing both antibiotics, but then are transferred to a plate containing only one (to maintain the plasmid). We know that bacteria, under optimal conditions, can divide every 20 minutes or so. We could periodically take out a sample and assay what proportion still maintain resistance to the missing antibiotic. The equation above can be rearranged again so that the fraction resistant, and the time on the new media, can be plugged in to estimate the mutation rate. 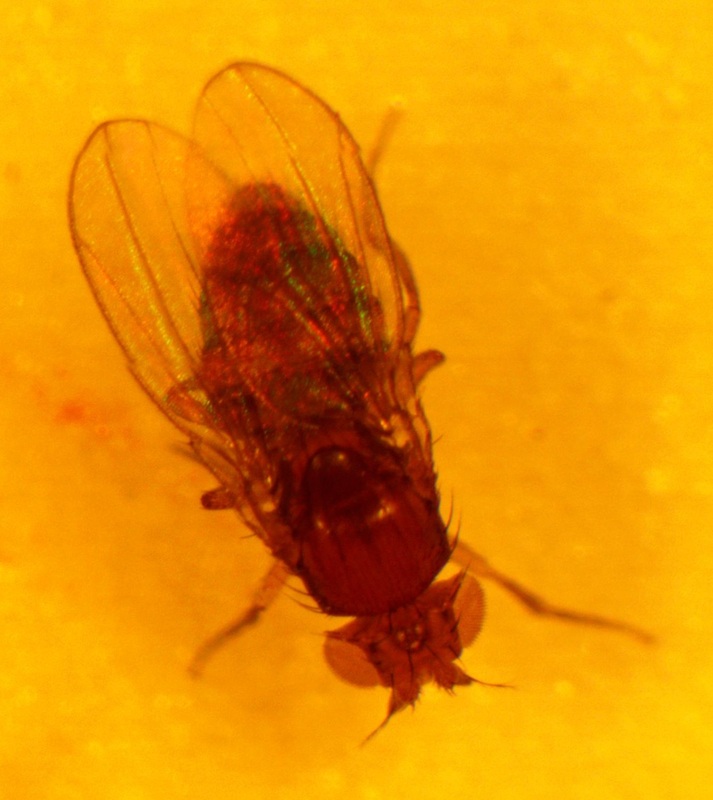 However, this does ignore any possible fitness cost to the bacteria to maintain antibiotic resistance, and selection could also drive the inactivating mutations to high frequency in the population (this could also be occurring in cave species; an energetic cost to producing pigments, or the presence of eyes providing a source of infections, could result in selection inactivating the genes even faster than predicted by mutation). when is near 100%. This is because almost all of the alleles are unmutated, so essentially any potential mutations that can occur do occur on unmutated copies. In terms of the mutant frequency , if the mutation rate is 1% and at first no mutants are present, in the first generation the mutant fraction is . In the second generation , which is almost 0.02. In the third generation , which is almost 0.03, etc. The low frequency approximation can be rewritten as (the mutant fraction each time step adds the same quantity to the initial number of mutants). This is a linear equation of the form , where b is the y-intercept and m is the slope of the line. So in this case the slope of the increase in mutant frequency is equal to the mutation rate. If the slope increases when chemicals are added to the broth the bacteria are growing in then they are potential mutagens. At any rate, the phenotypes of cave species and the predicted rapid inactivation of gene function by mutation in the absence of selection maintaining the function is a nice, simple, easy to understand example of inferred evolution. The mutations that can occur in bacteria are also a nice observable example of evolution in action. OK, that's enough for now. In future posts I will discuss some more complicated mutation models. This entry was posted in Uncategorized on April 11, 2013 by Floyd A. Reed. There are several interesting plants growing around the building where I work. 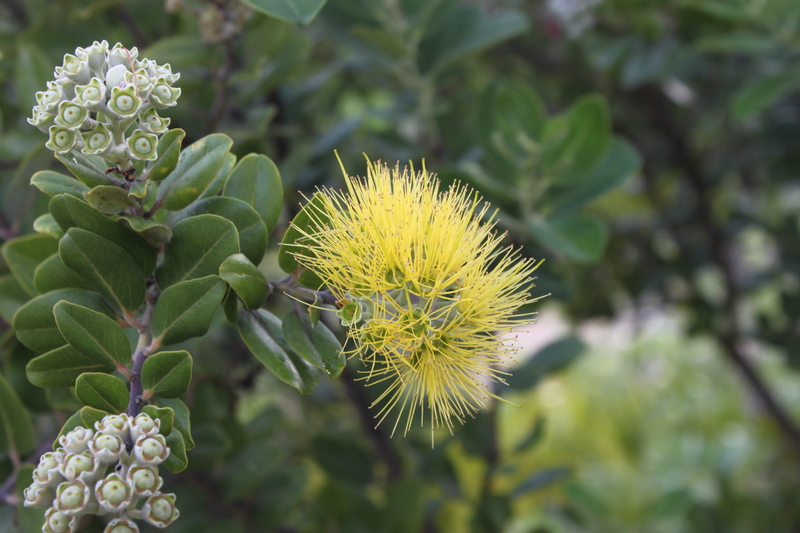 One of these is the native ʻŌhiʻa lehua (Metrosideros polymorpha). 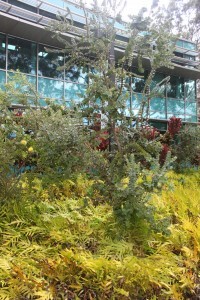 There are plants with red flowers (with darker leaves and stems) and ones with yellow flowers (with lighter leaves and stems). 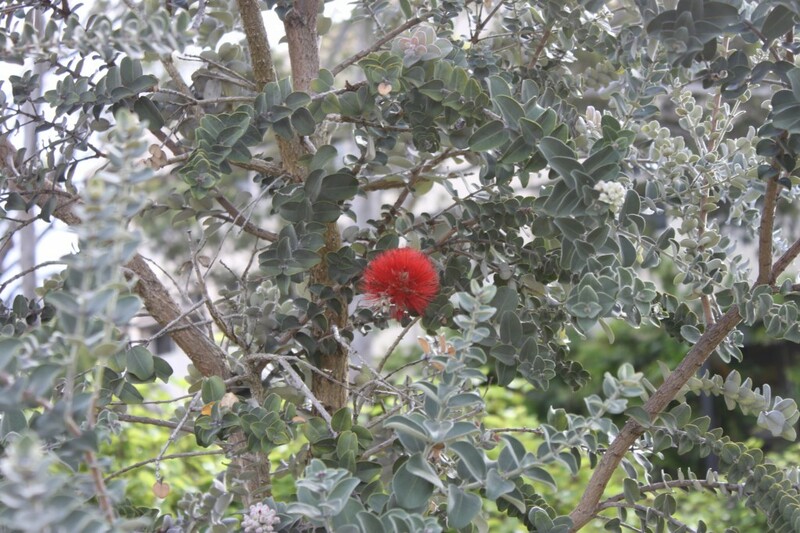 One of the students here told me that her grandmother said if you pick the flowers from a lehua it will rain. 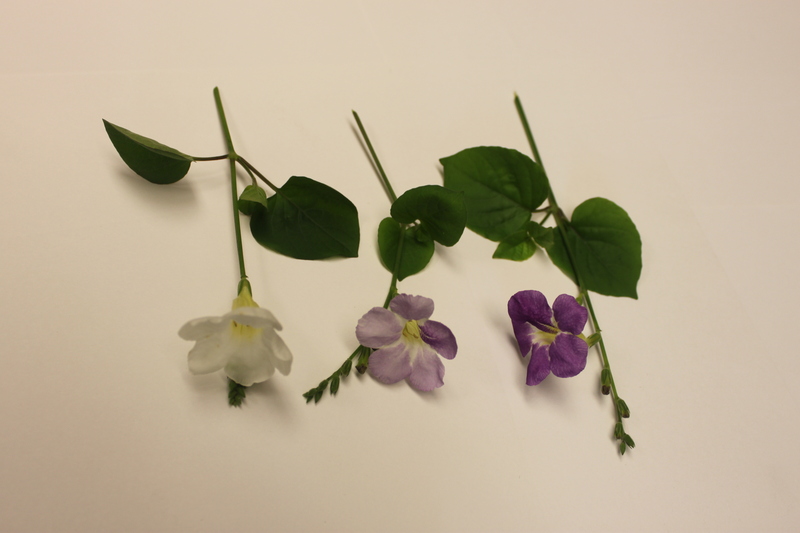 I took a small leaf sample for extracting DNA and some samples from three other plants for comparison. 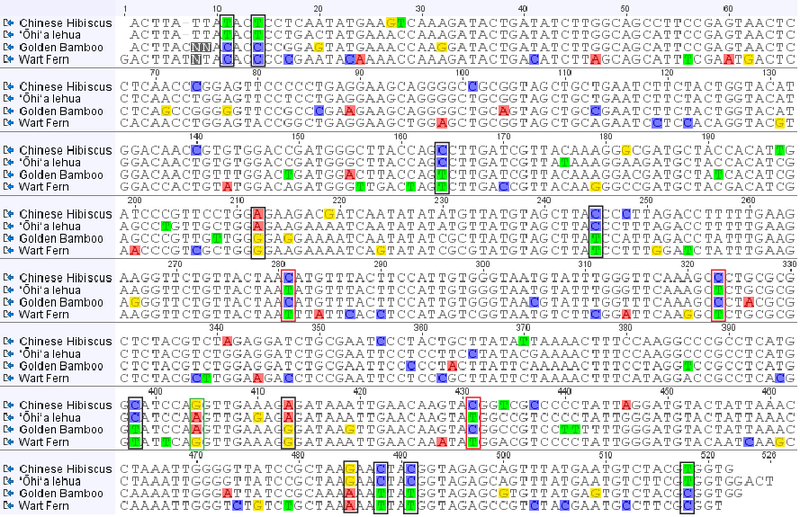 I planned to amplify and sequence a small segment from the chloroplast genome. Like the mitochondria, the chloroplast has a small genome that is a loop of DNA. It is much larger than the mitochondria but much smaller than the nuclear genome (which contain the linear chromosomes we are used to thinking of) of plants and animals. Of course the chloroplast is well known as the site of photosynthesis in the plant but it also carries out other functions. 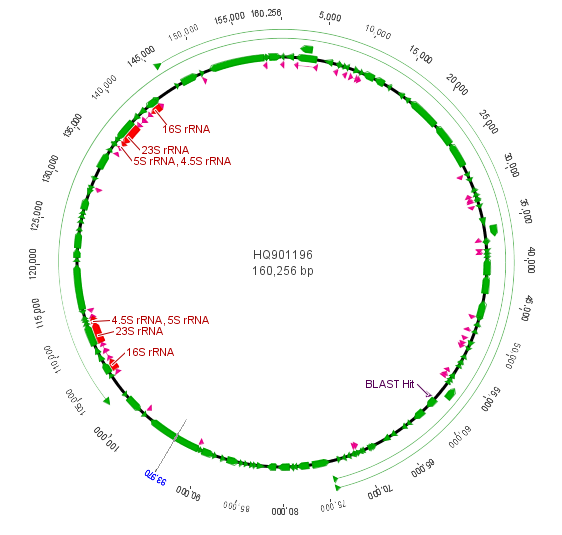 Here is a representation of the chloroplast genome from the cotton plant and then zooming in on a section of the rbcL gene (in the lower right) for sequencing. The purple "BLAST Hit" is the section sequenced. If you look back a few posts at the mitochondrial genome you can see that there are many more genes and the chloroplast genome is quite a bit larger. 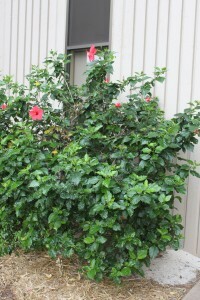 A close comparison that happened to be around was a Chinese Hibiscus (Hibiscus rosa-sinensis). The lehua and the hibiscus are both dicot plants. 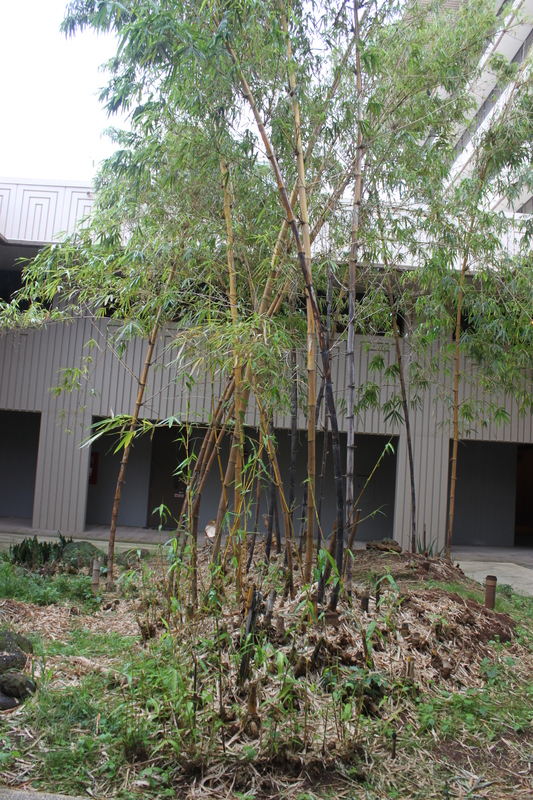 Moving further out is the golden bamboo (Bambusa vulgaris) which is a monocot but still an angiosperm (flowering plant). For an even more distant relative of lehua I took a sample from the wart ferns (Microsorum scolopendria) growing around their base. 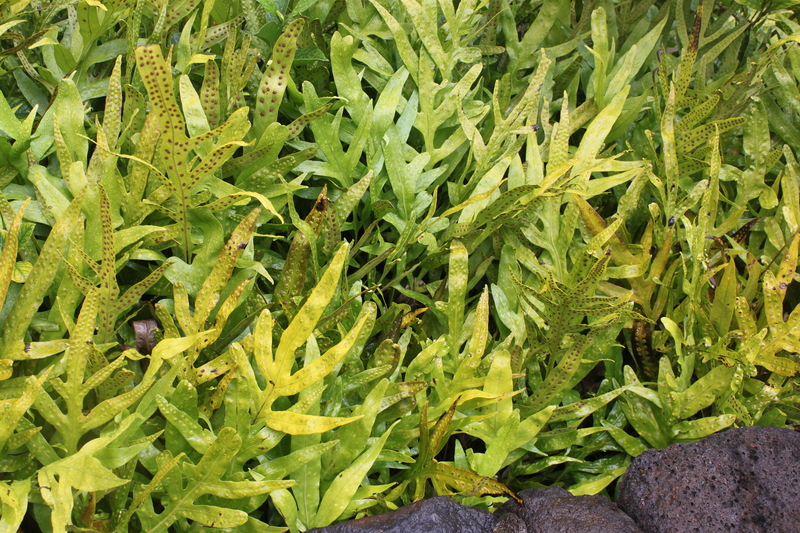 Like many plants M. scolopendria ferns were introduced to Hawai'i and they have now esabilshed themselves in the wild here. 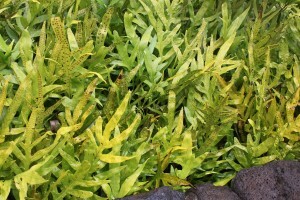 They are called "wart" ferns because of the spore clusters on the leaves. 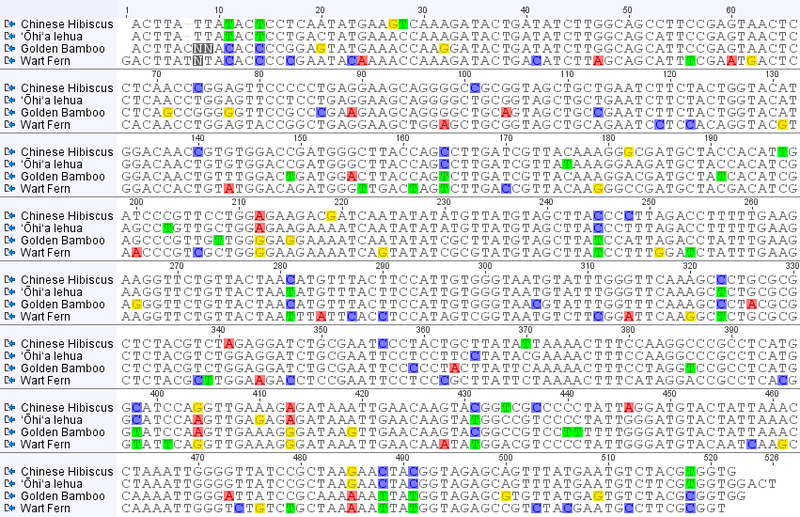 So here is what the alignment of the chloroplast DNA sequences from these four species of plants looks like. 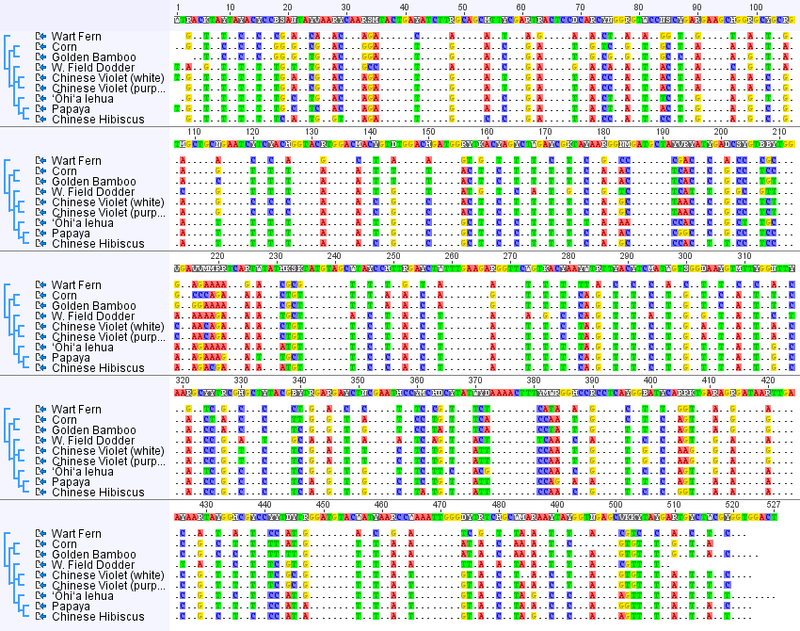 The numbers along each branch indicate the unique DNA basepair differences highlighted for each species (there are actually some more upon closer inspection that were not highlighted, as I mentioned above, but I left it as it is for now). 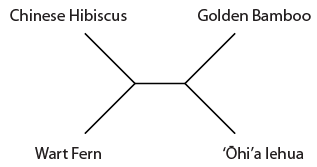 The "11" in the segment separating the lehua and hibiscus from the other plants represent the 11 differences (synapomorphies) only shared by these two species. However, there are some sites that do not share this pattern. For example, site 404 places lehua with bamboo and site 281 places lehua with the fern. Here is the alignment with the 11 shared sites mentioned above outlined in black, and the sites that are incongruent with the actual relationship of these species indicated in red or green (for the two different incongruent patterns present). 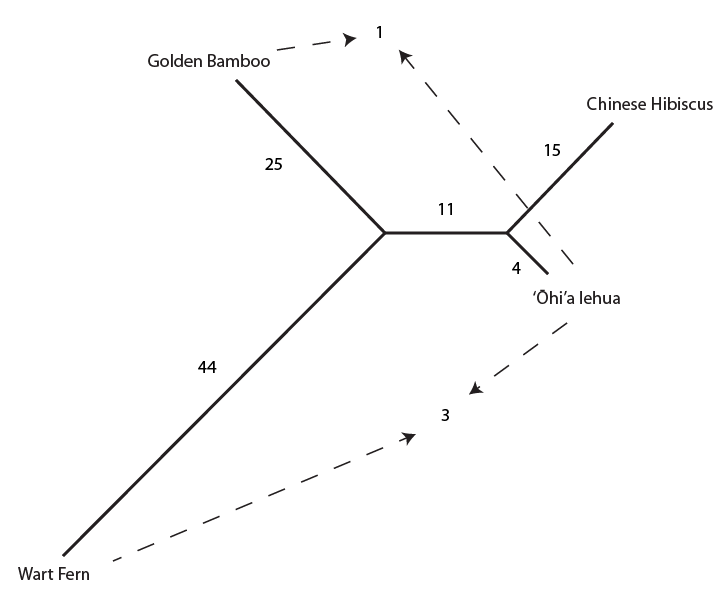 And below the incongruent sites are indicated on the tree with dashed arrows. 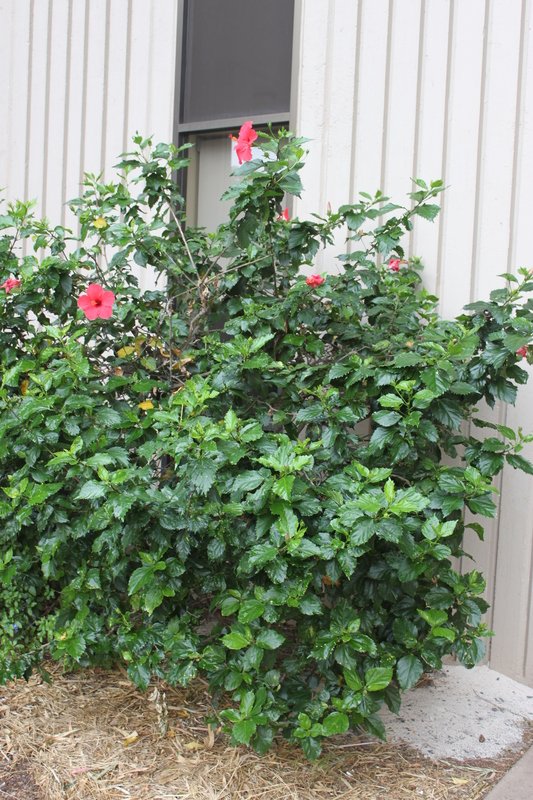 Overall the data suggests the grouping that we believed to be true a priori (based on observable physical characteristics of the plants), that the lehua and hibiscus are more closely related. 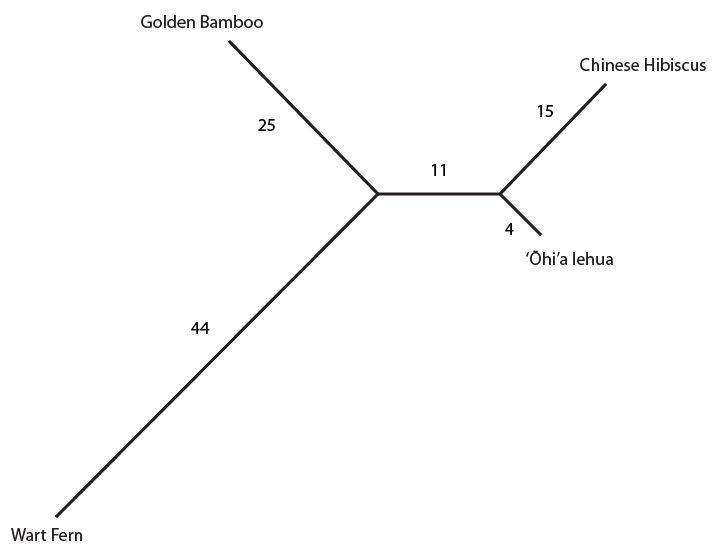 But one DNA position suggests a closer relationship between the lehua and bamboo and three positions push the lehua closer to the ferns. This gives some level of support for the following two alternative tree topologies. However, a far more likely explanation is that these DNA positions experienced more than one mutation event that resulted in parallel mutations to the same state in different lineages (or even a "back" mutation to an ancestral state after a lineage seperation.) This sharing of states from different events is termed homoplasy. Because of the long evolutionary distances between these species it is reasonable to suspect a few sites have had multiple "hits;" also, if you look closely, a few sites like position 20 and 149 have had multiple mutation events to more than two states (but these have not been highlighted by the software I used to make the plot). 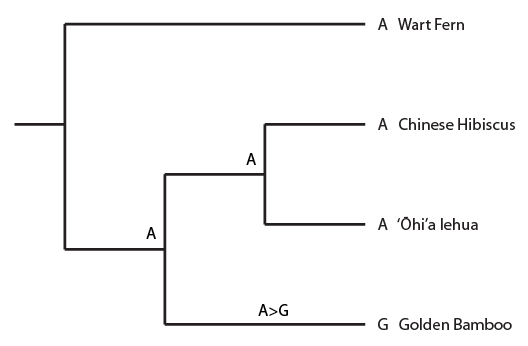 In the image below a past mutation even from an "A" to a "G" in the bamboo linage (for example position 32 in the alignment) is mapped onto the tree. This is a single (not shared) derived state (an autapomorphy) so it is not useful for inferring ancestral relationships, but it gets the ball rolling with thinking about mapping mutations onto a tree. Above the history of position 11 in the alignment is indicated. 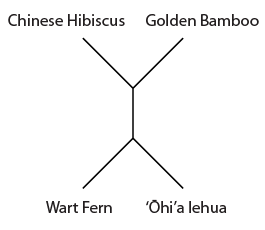 A C to T mutation occurred before the common ancestor of the hibiscus and lehua but after the species split from the lineage leading to the bamboo (indicated in the black box as in the alignment). And now I'll plot a homoplasy pattern that gives incongruent results. Here is an example from position 281 in the alignment. The lehua and fern share one state and the hibiscus and bamboo share the other. 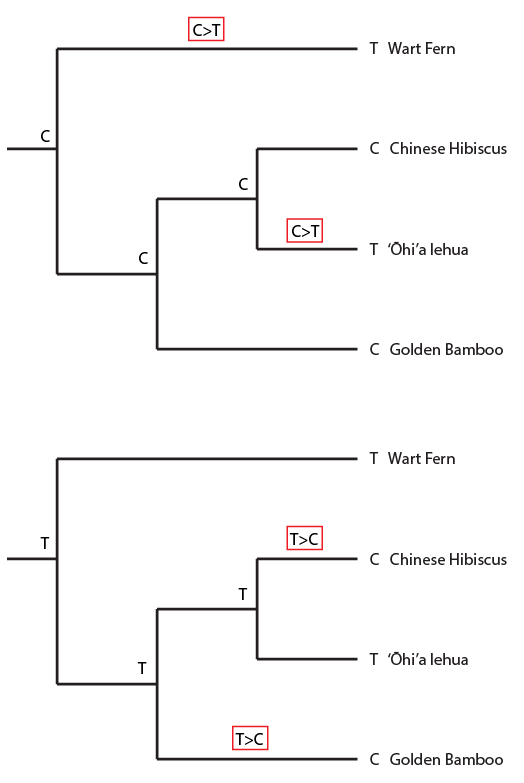 In this case we suppose that more than one mutation event has occurred in the history of this position, but based on only this data we cannot tell when/where it occurred, what direction it was in (a T to C or a C to T), or what the ancestral states were likely to be. And here is yet another possibility where a back-mutation occurred along a lineage to restore an ancestral state. This example helps illustrate that often in biology we deal with some level of uncertainty; but this does not necessarily prevent us from being able to make inferences. Also, assumptions are important tools to use to work through a problem, so long as we are clear about what those assumptions are. The four species used in this example cover a long range of evolutionary time. There is plenty of opportunity for multiple mutations to occur. When looking at closer related species there is often far less uncertainty (of the kind discussed here, homoplasy, for this type of gene--there are other types of issues with closely related datasets). This data also provides a "backbone" tree to place other plants onto as I collect more samples. This entry was posted in Uncategorized on April 8, 2013 by Floyd A. Reed.